The third benediction of the 'Amidah is called "Holiness of the Name" (R. H. iv. 4), to distinguish it from "Holiness of the Day," the benediction which refers to the Sabbath or a festival; but "Ḳedushshah" in popular speech means the body of the Third Benediction, as recited aloud by the reader in the 'Amidah, with the responses, in which the congregation joins. Of responses there are at least three: (1) "Holy, holy, holy, is the Lord of hosts: the whole earth is full of his glory" (Isa. vi. 3); (2) "Blessed be the glory of the Lord from his place" (Ezek. iii. 12); (3) "The Lord shall reign for ever, even thy God, O Zion, unto all generations. Praise ye the Lord"(Ps. cxlvi. 10). In the Additional Service for Sabbaths and festivals, and in all the Atonement services, there are two further responses, evidently of later origin: (4) "Hear, O Israel, the Lord our God, the Lord is One," and (5) "I am the Lord your God." The privilege of joining in these responses is considered to be among the chief inducements for worshiping in public. The authorities speak of three kinds of Ḳedushshot—the Ḳedushshah Me'ummat, the Ḳedushshah Meyushshab, and the Ḳedushshah de-Siddur, each of which has a separate history (for which see Zunz, "G. V." p. 382 [2d ed., Note D], and Baer's "Prayer-Book"). "We will revere and sanctify Thee, as in the secret whisper of the Holy Seraphim, who sanctify Thy Name in holiness, as it is written . . ."
"Of His glory the earth is full; His ministers ask each other, Where is the place of His glory? Opposite . . ."
"May He from His place turn in mercy and show favor to the people who unify His name, who evening and morning, each day, unceasingly in love cry twice, Hear!" "One is our God; One, our Father; One, our King; One, our Saviour; He will proclaim to us in His mercy again in the presence of all that liveth; to be your God"
"And in Thy holy words . . ."
"The crown ["keter"], O Lord, our God, the angels, the throngs on high, offer to Thee; also Thy people Israel, who are gathered below; all of them, as one, sound the 'Thrice Holy' to Thee, as it is written," etc. The Ḥasidim and the South-Russian Jews have adopted this among other features of the Sephardic ritual. After the last response the reader proceeds, in the German ritual: "To all generations we will tell of Thy greatness, and to all eternity we will sanctify Thy holiness; and Thy name, our King, shall never cease from our mouth; for Thou art a great and holy God and King; blessed . . ."; while among the Sephardim the reader proceeds with the benediction as in the silent prayer. Neither the Mishnah in the above-cited section, nor the Babylonian Talmud, which (Meg. 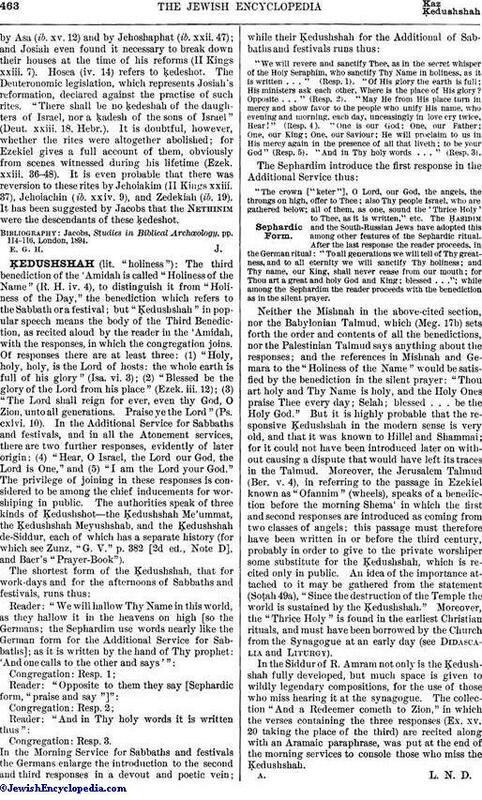 17b) sets forth the order and contents of all the benedictions, nor the Palestinian Talmud says anything about the responses; and the references in Mishnah and Gemara to the "Holiness of the Name" would be satisfied by the benediction in the silent prayer: "Thou art holy and Thy Name is holy, and the Holy Ones praise Thee every day; Selah; blessed . . . be the Holy God." But it is highly probable that the responsive Ḳedushshah in the modern sense is very old, and that it was known to Hillel and Shammai; for it could not have been introduced later on without causing a dispute that would have left its traces in the Talmud. Moreover, the Jerusalem Talmud (Ber. v. 4), in referring to the passage in Ezekiel known as "Ofannim" (wheels), speaks of a benediction before the morning Shema' in which the first and second responses are introduced as coming from two classes of angels; this passage must therefore have been written in or before the third century, probably in order to give to the private worshiper some substitute for the Ḳedushshah, which is recited only in public. An idea of the importance attached to it may be gathered from the statement (Soṭah 49a), "Since the destruction of the Temple the world is sustained by the Ḳedushshah." Moreover, the "Thrice Holy" is found in the earliest Christian rituals, and must have been borrowed by the Church from the Synagogue at an early day (see Didascalia and Liturgy). In the Siddur of R. Amram not only is the Ḳedushshah fully developed, but much space is given to wildly legendary compositions, for the use of those who miss hearing it at the synagogue. The collection "And a Redeemer cometh to Zion," in which the verses containing the three responses (Ex. xv. 20 taking the place of the third) are recited along with an Aramaic paraphrase, was put at the end of the morning services to console those who miss the Ḳedushshah.